When properly raised and processed, 100% grass-fed bison meat has a distinctly natural flavor. It's slightly sweet, just the way nature intended. There is no bland fatty after taste which is often associated with grain-fed bison, a product that actually tastes a lot like most store bought beef. Grass-fed and finished bison has a healthy Omega 6 to Omega 3 fatty acid ratio of 4:1 or less. 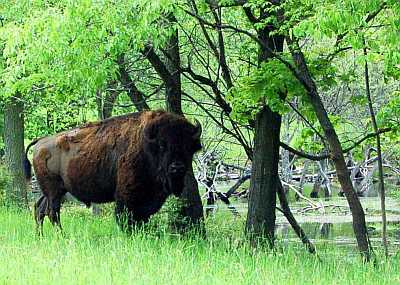 For grain-fed bison that ratio can climb to a very unhealthy 20:1, or sometimes even higher. High Omega 6 to Omega 3 ratios have been linked to heart disease, inflammatory diseases, obesity, diabetes, cancer, and behavioral disorders. In hunter-gatherer times, more than 10,000 years ago, grain consumption was perhaps incidental at best. The Omega 6 to Omega 3 ratio in those times was closer to 2:1 or 1:1. Our bodies haven't changed all that much in the last 10,000 years. But unfortunately our eating habits as a society, especially in the last 40 years or so, have changed dramatically, and for the worse. High Omega 6 to Omega 3 ratios can be directly linked to excessive consumption of grains and an ever expanding range of derivative products. • considerably higher in beta-carotene and conjugated linoleic acid (CLA), both being practically non-existent in grain fed animals. Beta-carotene is used in the body to make Vitamin A, a powerful anti-oxidant linked to preventing cancer and cardio-vascular disease. 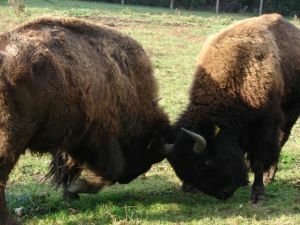 It can also give grass-fed bison fat a slightly yellow color; something that the grain-driven part of the bison industry will sometimes erroneously play up as a negative factor. Grain-fed bison has white fat, much like you see in most, if not all, supermarket beef; a fat whose health benefits are compromised by high Omega 6 content. In preliminary studies CLA, a fatty acid, has been linked to reducing the risk of cancer, diabetes and obesity. But please be advised the benefits of CLA are best realized from animals finished on fresh green grass, not hay. 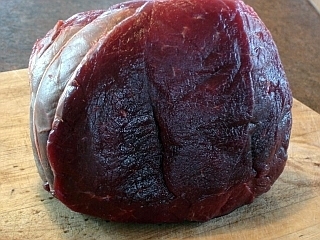 Bison meat available for sale is usually harvested from animals that are approximately 2 1/2 to 4 years in age. It's the best tasting and most tender. Coming off well managed pastures, meat from grass-fed bison in this age range will have a very agreeable richness in taste that is somewhat sweet; a taste that is rarely realized in feedlot or grain finished bison. Meat from older grass-fed bison, over 4 to 5 years of age, most notably the bulls, can have a much more distinct flavor. Grass-fed bison are raised in pastures and are never exposed to management practices which include feedlots or feedlot finishing. The ideal grass-fed bison diet is approximately 93% grass, 5% forbs (alfalfa, clover, wildflowers etc. ), and 2% browse (leaves from woody plants). Mineral supplements can be part of their diet, especially over the winter months. On occasion, bison may be fed some oats or other grains as an enticement to move from one pasture to another. But under no circumstances are grains (corn, wheat, barley, oats etc.) a staple in the grass-fed bison's diet. In addition, best practices protocol does not allow for the use of antibiotics, growth hormones, or chemical parasite control. Health benefits from grass-fed bison meat are best realized when these animals are allowed to graze and finish on green leafy grasses. The same benefits are not obtainable from grasses gone to seed, or hay. The sweeter these fresh grasses are, the better. That way bison being readied for market will steadily gain weight. Progressive weight gain helps ensure meat tenderness. For most of North America this means the most nutritious, best tasting and tender bison is usually harvested between June and November. Like other red meats, bison meat does contain intramuscular fat. With grass-fed bison this fat is usually not noticeable to the naked eye. But with grain-fed bison flecks of intramuscular fat, or marbling as it is more commonly known, are sometimes visible. Unfortunately many consumers mistakenly believe that no 'marbling', or a lack of fat, means no flavor. But with bison, like other lean red meats, it is the moisture content (about 75% of it's raw weight) that imparts flavor to the meat, not the protein or fat content. The best tasting bison will be finished on low protein--sugar rich lush green pasture, and not be exposed to stressful pre-slaughter practices. After slaughter, appropriate carcass handling/dry aging, and professional meat cutting will result in a quality product. Then all you need to do is follow our recipes for a great bison meal experience. The muscles that run along the backside of the bison are the ones that provide the tenderest cuts. In the roast category this includes prime rib, loin, sirloin, and to a lesser extent sirloin tip. The tenderest steaks include rib steak bone-in, rib-eye, loin (New York strip), sirloin, T-bone, and tenderloin. These tender cuts, both roasts and steaks, require minimal preparation. Their flavor is best enjoyed without any marinating; only a modicum of seasoning is sometimes used. For many people, salt and pepper is all it takes. When it comes to meat tenderness, perhaps animal stress is the one area of concern that is rarely explained. An otherwise perfectly good tender steak can be ruined if the animal is experiencing stress. Stress can be caused by such things as improper diet, climate or environment, disease, and/or social factors. But the area of stress we should be most concerned about is pre-slaughter stress. Usually bison have to travel to a slaughter facility to be processed. Ideally this facility should be no further than 3 hours from the farm. Much longer travel duration is best avoided, otherwise the bison will have to be de-stressed and settled over several days before being slaughtered. Loading and trucking bison to the slaughterhouse must be as stress free as possible. Quiet, peaceful loading and non-slip floors are a must. Crowding must be avoided. Poor driving practices and/or rough roads can also stress bison. Pre-slaughter procedures at the slaughterhouse must be gentle and quiet. Slaughterhouse employees who yell or use cattle prods will increase stress. Stress will invariably cause sugar (glycogen) reduction in the bison's muscles. 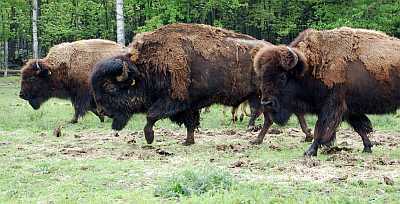 Meat from bison with low glycogen levels at the time of slaughter will be of inferior quality. After arriving at the slaughtering facility, bison should be settled in a holding area that is not overly confining with access to fresh water and hay. Resting in a peaceful environment for several hours, a day if possible, will allow the bison's metabolism to return to normal-glycogen levels will again become elevated. Glycogen converts to lactic acid after a bison is slaughtered. Lactic acid is needed to produce quality meat with good shelf life which is tender, flavorful, and of eye appealing color. The presence of lactic acid can be measured after slaughter. A pH level of 5.5 to 5.8 indicates ideal levels, whereas levels approaching 7.0 indicate the bison was under stress, injured, or diseased. High pH value meat has a short shelf life, lacks quality, and is an unappetizing dark color. To avoid all the stressful perils associated with transporting bison, in-field on the farm slaughter has started to become more common. Where allowed, slaughtering done by a qualified mobile abattoir operator will ensure that the process can be done without stress. The result is quality bison meat every time. The best example of this process is shown in the video below. To ensure quality meat, proper post slaughter cooling and dry aging is absolutely necessary. Immediately after slaughter a bison carcass should be hung and cooled in a 15-16C (60F) environment for 2 to 3 hours, or until its muscles completely stiffen. Following this initial cooling period, gradual cooling to a temperature just above freezing (1-2C, or 35F) in a relatively humid cooler environment with good air circulation is required. This is where the carcass will remain for what is usually 10 to 14 days of dry aging. Rapid cooling a bison carcass to freezing or near freezing temperatures immediately following slaughter is best avoided. Doing so can result in severe muscle contracting, an unreasonable loss of meat juices once the meat is completely thawed, and consequently a tougher less satisfactory product. Unlike commercially raised beef which can be rapidly cooled because its meat is well protected from extreme cold by a heavy layer of insulating fat, bison, especially grass-fed bison, has a much leaner fat cover. 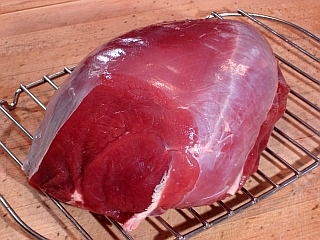 Care concerning proper cooling techniques and dry aging for this animal will add flavor, and help tenderize the bison meat while keeping the loss of meat juices minimized. Following dry aging, the bison is cut down into home-use steaks, roasts, and prepared into ground etc. The meat you ultimately purchase will usually be a better product if it is aged and cut by an experienced butcher. These experienced trades people know how to cut an animal down from nose to tail. Unfortunately, for the sake of profit, major corporations have 'dumbed down' the trade. They don't need or want butchers, just cheaply paid line workers who can cut down an animal in a hurry. This sort of dumbing down has been going on in the meat industry since the early '60s. Regrettably it is the kind of service many independent farmers are stuck with. Want to be assured the best quality meat for your dollar? Then buy from a reputable retailer who employs in-house butchers. That way you know a quality animal has been butchered properly. When buying directly from the farm, or farmers' market, it's best to start out with an inexpensive purchase of ground bison to make sure the product meets your expectations. Large or bulk purchases should only be made if consistent quality can be assured. Exercise caution if farm visitation is discouraged (which is very rare), if the farmer has recently changed processors, and in cases where the bison being offered has been imported from another farm for the purposes of quick sale.